Most of the current public safety broadband challenges can be tackled by smartly using not one, but several existing networks. By combining readily available networks the access can be improved significantly, the reliability and resiliency is not of a single network, but of an independent combination. Availability and quality of service are what the operators can jointly offer. The network infrastructure providers will naturally develop the spectrum efficiency to maximize the efficiency of their network and roaming could be provided between networks, using the best one available. What do these combined networks then practically have to offer? The challenge is the always online connectivity especially when we are in moving vehicles. The recent studies show sometimes as low as 70% availability for any single 3G network even in the best coverage areas. Table 1. Example of single and multiple broadband network availability. The usually discussed needed availabilities for dedicated PS broadband are at the level of 99%. It is clear that providing that kind of availability over dedicated networks incorporates huge costs when applied over a larger region. It is understandable that the single carrier approach that occasionally provides these low availabilities is not sufficient. Luckily the statistics help with the multiple network approach. With two 3G networks, as presented here, as low as 64% over first network and 76% over the second one provide a combined availability of over 99%! Just by using two networks the availability needed can thus be met. And introducing 3rd network enhances that even further. When the switch over from network to another is seamless, one can claim that this approach provides for the needed technical functionality that is acceptable for critical communications already today. The ultimate counterargument is always that there will be situations when none of the commercial networks will function. They can be blocked due to other traffic, there are areas where commercial networks don't exist or power could be cut off. In these cases there remains a need for priorisation, QoS or even dedicated networks. 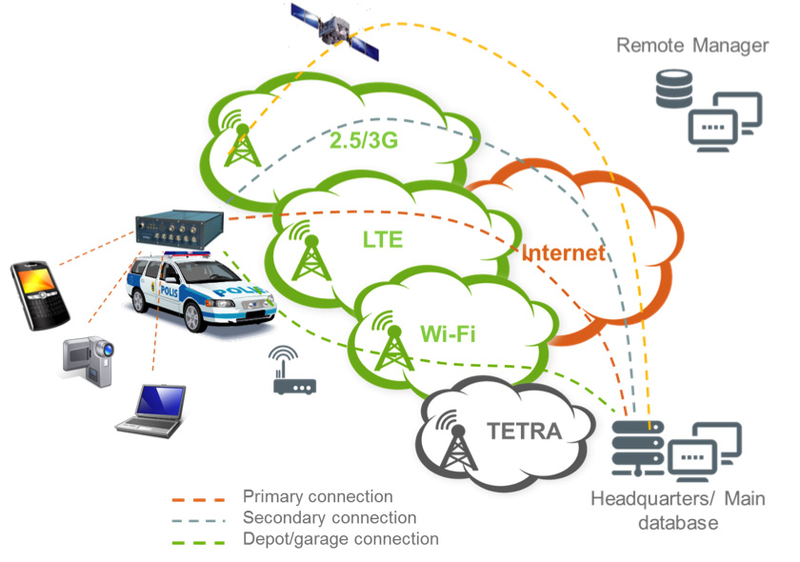 Different dedicated LMR technologies, like TETRA, need to be there as a back up also for data. There is, however, a chicken and an egg problem here. The broadband solutions are needed in daily operations today. Should we postpone the introduction of broadband data to PS because of possible rare incidents or could we introduce a concept that works now and can be upgraded to meet the requirements of future as needed regulatory decisions are made? I think broadband should be introduced today and upgraded later. But not just any kind of a solution. We need a future proof solution that is capable to meet most of the demands of criticality today! The solution requires for router equipment in the vehicle with very special features that are unmet by established router manufacturers today. These services can be used in critical environment only by using routers that are specifically designed for the purpose. This includes special hardware, software and management features. The most important software feature for the router system is the capability to switch over from network to another seamlessly, without any service interruptions. Mobile IP tunneling implemented by few manufacturers is a part of the solution. This technology hides the network changes from the termination point and enables fast switch over without unnecessary VPN negotiations. PS customers always use encrypted traffic, so various levels of VPN tunnels are used by different user organizations. MIP also guarantees session persistency so that the users are not required to re-authenticate to their backend systems every time a link is changed. But MIP cannot handle the fast switch over just by itself. The mobile networks are extremely dynamic and having data streams to and from moving vehicles increases the demands of the connection. The networks are mainly designed to serve nomad customers and systems that solemnly depend on networks’ routing capabilities cannot follow a fast moving vehicle. With just protocol based routing the switch over decision cannot be made quickly enough. The only feasible solution is to use predefined routes and predict at all times the best possible routing for any the used links. This enhances the capabilities for decision making about when the network switch over is necessary. For this very same reason load sharing or data bundling over multiple networks seldom provides any advantage. The router software requirements include also the capability of autonomously control the used modems. The modems tend sometimes to stay in “hanging” mode and look like they are connected to the network, but no data is transmitted. This and other similar dysfunctions need to be detected by the router and software needs to wake the modems up. The router market offers quite a few appliance hardware solutions for router developers. These appliances are not designed to handle the specific requirements of critical PS communication. The first needed requirement is flexibility. When the connectivity is introduced to wide areas, it is often demanded that various routers have quite different hardware configurations. This is mostly emphasized in the WAN link flexibility. In many cases two links might be enough to fulfill the criticality demands, but there are cases where 3 or even 4 links are necessary. These links need to include all UMTS technologies (3G and 4G), but also capabilities for all CDMA based technologies and even satellite connectivity. Robustness of hardware is a must in these demanding applications. Although the routers are located inside the vehicles, the shock resistance and IP classification needs to be high. It is clear that consumer products or slightly upgraded consumer products will not offer the long time durability required. Router demands also carrier class hardware approach when it comes to updating the software. When remote software update is implemented, the router needs to test it before taking into use. This requires double memories. There is also needed a software functionality for fall back to elder functioning version if something goes accidentally wrong. Sometimes just software based booting of the equipment is not enough. It is upmost important that the hardware has functionalities to mechanically switch the power off. This mechanical power switched, controlled by the software, are one element of a perfect solution for PS. Similar functionality is needed in the power back-up. The vehicle on battery should be used, but with starting the vehicle the power to the router should be remained. Special up to 30 seconds back-up without extra battery is thus needed. A horror for the PS broadband user is just a box with no remote monitoring, configuring or set-up possibilities. The demand is that the connectivity to all routers, even to thousands of units, should be monitored from a one secure system from a secure location. The communication between the management server and the router should not depend on which links are used for the actual network connection and it should always be encrypted. Software upgrades shall be made easy in a way that even large amounts of routers can be updated simultaneously. The routers in themselves should not have fixed IP address requirements for security reasons. The contact to management should always be initialized by the router. Easy management interface that can handle the number of routers and does not require any special coding expertise is needed. Finally, the status of the routers and their links including connections, modems and even SIM-cards should be made possible to monitor over large amount of routers with a simple graphical interface. Special purpose router equipment, a multichannel router, is required in all furture scenarios of providing broadband data to Public Safety. No general appliance based or originally for consumers developed routers can meet the requirements for secure always on-line connectivity in vehicles. The solution has special requirements for software, hardware and remote management. When all of these areas are considered in the design, the ultimate target of providing critical connectivity can be met cost efficiently. This is what a hybrid network approach can provide for public safety today. And with right system the upgrade to future networks will be easy. Nice Explanation thanks for sharing. We provide ITnetwork management services across Virginia, Washington DC and Maryland. managed IT services in Maryland.